Wingless Crypturaphis females are dorsoventrally flattened and have peculiar projections on the head and prothorax. The antennae are shorter than the body. 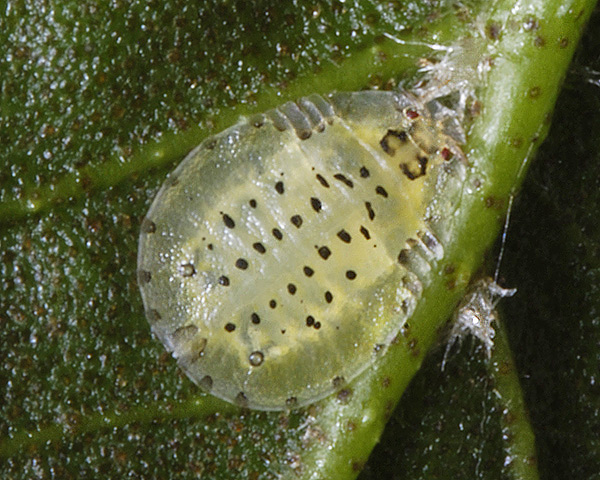 The apterae resemble coccids rather than aphids. 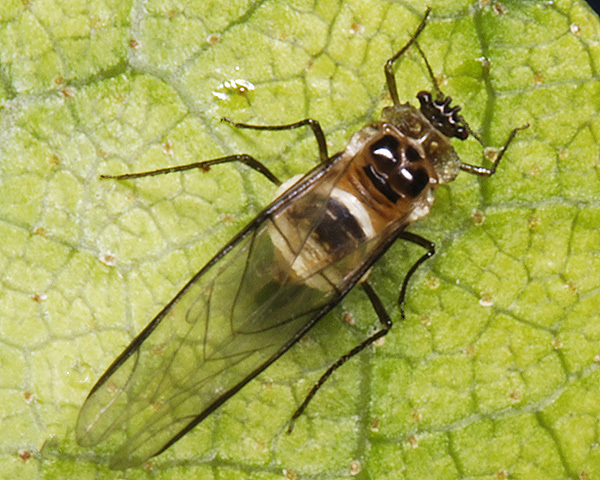 The winged alate has a more typical 'aphid appearance'. The Crypturaphis genus has only one species, which lives on the leaves of Italian alder (Alnus cordata). It has a sexual stage in its life cycle, but does not host alternate. It is not attended by ants. The rather translucent yellowish-green to yellowish-orange viviparous apterae of Crypturaphis grassi (see first picture below) are dorso-ventrally flattened with plate-like frontal and lateral projections. They have a double line of brown spots extending along the mid-line, as well as spots around the edge of the abdomen and on the head. The inconspicuous siphunculi are small and conical. The body length of adult apterae is 2.3-3.2 mm. Winged forms (see second picture above) have a black head and thoracic lobes, a paler prothorax, and an ill-defined and variably developed brown patch across abdominal tergites 5-6. The body length of Crypturaphis grassi alates is 2.2-3.0 mm. Immature Crypturaphis grassi are a very pale translucent yellow-green. Oviparae (see first picture below) are similar in size and shape to the viviparous apterae, but are orange-brown in colour with transverse dark abdominal stripes, rather than spots. The oviparae have wax producing glands ventrally on either side of the cauda. Italian alder aphids live dispersed along veins on both upper and lower leaf surfaces of Italian alder (Alnus cordata), and are apparently specific to this host. Oviparae and males occur in October-November, but aphids may overwinter viviparously. Crypturaphis grassi is native to southern Italy and Corsica, but was first recorded in the UK in 1998, and has since spread widely in southern England and Wales. The northward shift in the distribution of this species has been attributed to climate change (Jansen & Warner, 2002).